It’s now 16 years since Razorlight formed, 14 years since debut album ‘Up All Night’. It’s remarkable to think that in that time there have only been three studio albums (although a fourth is to be released this year) and they still remain a household name. Probably due to impressively selling over 4 million albums and winning the NME New Band Award back in 2005. Despite their hiatus, they still play to packed houses of adoring fans and demonstrate a musicality on stage that many would envy. Add to that Borrell’s unquestionable ability for writing disarmingly gorgeous songs with hooks and catches to die for and it’s easy to see why. We caught up with Skully, Razorlight’s American Drummer, prior to their Thursday night headline slot at Y-Not Festival this weekend. Our attention was drawn back to you guys after Johnny released solo track ‘My World, Your Life’ back in May. Was you aware that Johnny was planning to release new music? Yes, of course, Johnny is always making music under one guise or another so it didn’t come as a big shock when the announced he’d be working releasing some solo work. It’s great because he’s a brilliant song writer. We knew that new music was coming for Razorlight, as we’d started the very first step of that process and putting Razorlight out there, for the first time, in a long time. Talking about the new album which has been described as ‘highly charged’ what can fans expect? It really is a brilliant Razorlight album and its super energy and super fun, it does all the things that Razorlight do well, good intensity, thoughtful, it’s energetic, it’s interesting – I think its great. We’ve already been playing quite few of the songs and will be playing them tonight at Y-Not festival, as we are headlining we get a little more time so it will be great to play a few more. We’ve been doing shows all summer long and the new songs have been received really well. How does the album differ from 2008’s ‘Slipaway Fires’? Well, obviously ten years on Johnny’s in a different place with his songwriting and personal life. I think its great that there are new musicians involved with the writing and working of it with him, as yes he’s the main guy but we’ve all contributed to it. It’s going to be surely different as there are different people having an input, at the end of the day we’re very proud of the record and we can’t wait to release it. 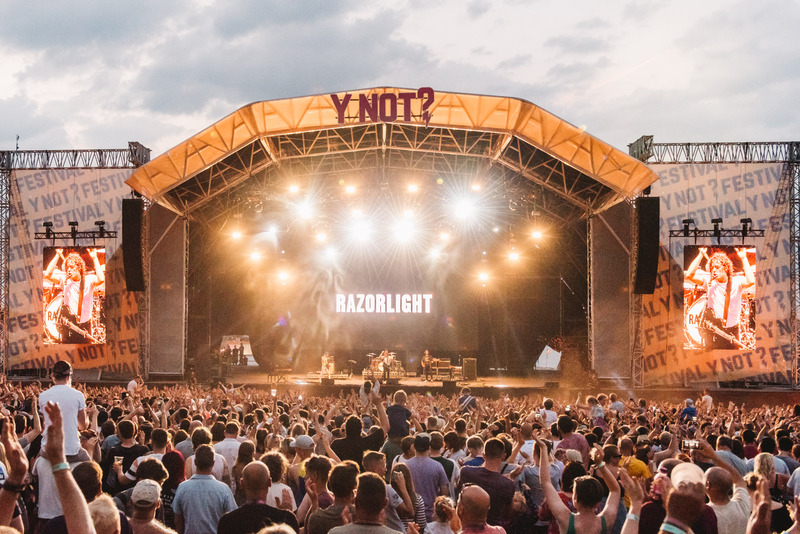 After been away for quite a while, what do you think can Razorlight bring to the current music scene? I think Razorlight is a class act, great band, great songs, great energy and attitude and we are a rock ’n’ roll band. These days that is not as in fashion as it once was but who cares, we do what we do and we do it really well. We do it with poise and passion and that is what we will bring back to the current musical climate. There are so many boring and receptive articles claiming guitar music dead – is it? It depends on what you say is dead because it doesn’t get played on Radio One as much? Does that mean its dead? I don’t think so, we play shows to thousands of people who absolutely love it and sing along to all the songs. Some of them wasn’t even born when the first record came out – so people are still discovering guitar music. Do you think people should be doing more to get behind guitar music? Yes, but it is difficult as peoples tastes change and things that was popular ten years ago might not be now. It will different in five months things move so fast now, people are fickle and people have access to music at their fingertips and not to sound old but when I was a kid you had to save up and go to the record shop where they’d be three records you’d want but you’d only have money for one, so you’d have to take a gamble. I think that instant access to music nowadays creates a fleeting interest and again makes people fickle. The last record I purchased was Tame Impala – Lonerism. ‘Currents’ is also just fantastic, we did a show with them years ago when they were first starting out in Australia. Last but not least, we work with a lot of unsigned artists as well as bands like yourself who have successfully broke through, what advice would you give to those in the early days of starting out? I think my advice to young bands would be you’ve got to work your hardest 24/7, its not going to land in your lap, it takes a lot of hard work and these artists don’t just appear and have suddenly just become big, it takes a lot of hard graft, effort and a great team around you. You’ve just got to put the time in, a lot of young bands think I’ve got a million plays on Spotify I’ve arrived and now every door should be open to me but it doesn’t work that way. It’s again hard work, you must keep your integrity in everything you do and believe in it and mean it, if you do those things its giving yourself the best chance you can. 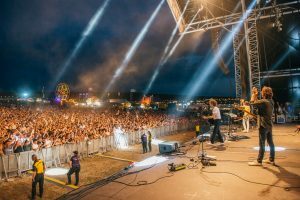 Razorlight play Solihull Summer Festival on the 26th of August and Cool Britannia Festival at Knebworth Park on the 2nd of September. The new album is out later this year.